There's a beautiful field of wildflowers at the dinosaur park. 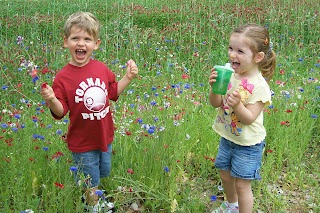 Dawson and Kaelin enjoyed playing in them, picking them, and even having them "cheers" (think of a cheers with cups and that's what they did with their flowers). 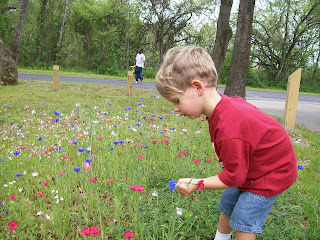 Dawson picking one of each color of flowers. 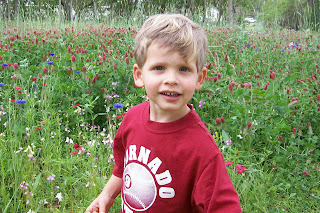 Dawson in the flower patch. 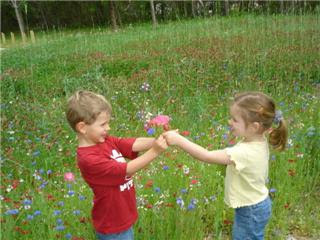 Dawson and Kaelin toasting their flowers - "cheers." Getting a big kick out of themselves. Their smiles and laughter are infectious. 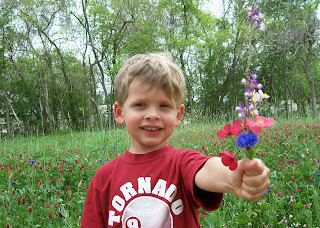 Showing me his bouquet of flowers, which he took home to give to Daddy.